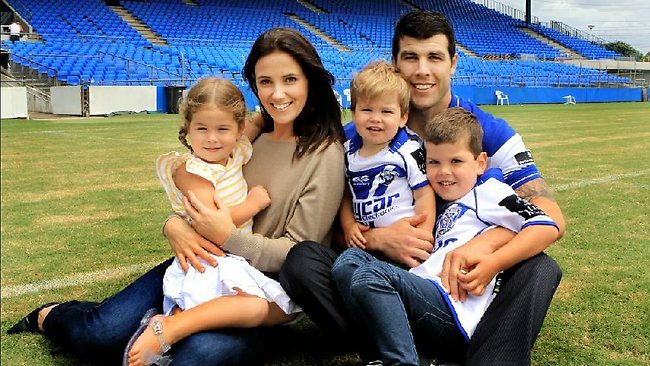 Michael Ennis and his wife Simone recently welcomed their fourth child, and have named their daughter Evelyn Swan. Evelyn joins big brothers Jack and Randy Wolfe, and big sister Koby Fox (or Koby-Fox, or Kobyfox – I have all seen all three reported as her name). The animal spirits continue! Evelyn’s birth was reported on Thursday night’s televised NRL game, and the commentators began bickering about whether Swan was a “person’s name” or “just a surname”. Michael’s family has been previously featured on the blog, and he is signed with the Cronulla Sharks for next year. Heath L’Estrange and his wife Jess welcomed their first child in October last year, and named their daughter Grace. Heath has played professional rugby league since 2004, and spent four years with the Bradford Bulls in the UK. He signed with the Sydney Roosters this season.